This is a simple Vanilla Bean Ice Cream base. 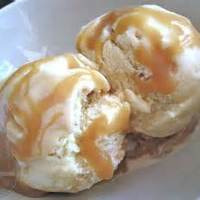 I used Wayne's ice cream base he posted and added caramel. By adding LA Caramel, it gives a heavier richness to the VBIC. I think you could pair just about any fruit with this base. I am very new to mixing and would appreciate any critiques of this base. Most of my recipes are mixed at maxVG.